After an amazing sunshine filled holiday in Spain i've landed back with a bump and I'm so so happy to report... we now have two out of our three bathrooms complete - hurrah! Our bathrooms have been ongoing projects for a while now, we opted to do all three in one swoop (perhaps not the wisest idea) but at last the end is in sight. In ode to our shiny new bathrooms i want to share with you one of our new DIY projects. Our bathroom has been painted a neutral off white which offset the darkness of our stone tiles beautifully. 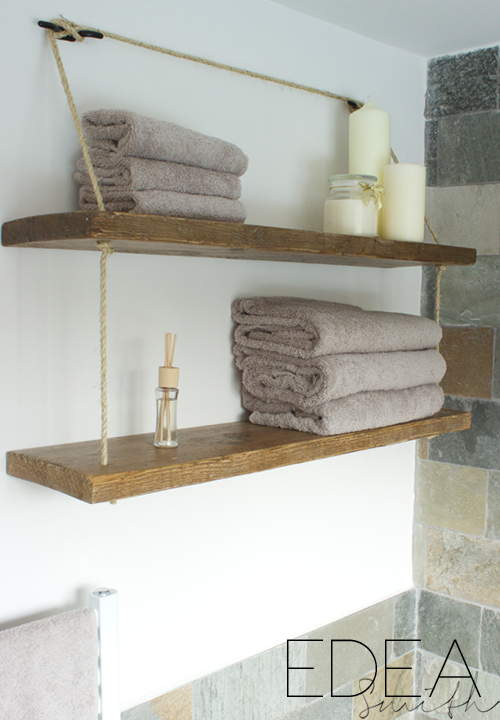 Above our bath we had a 'blank space' which cried out for chunky wooden shelves. 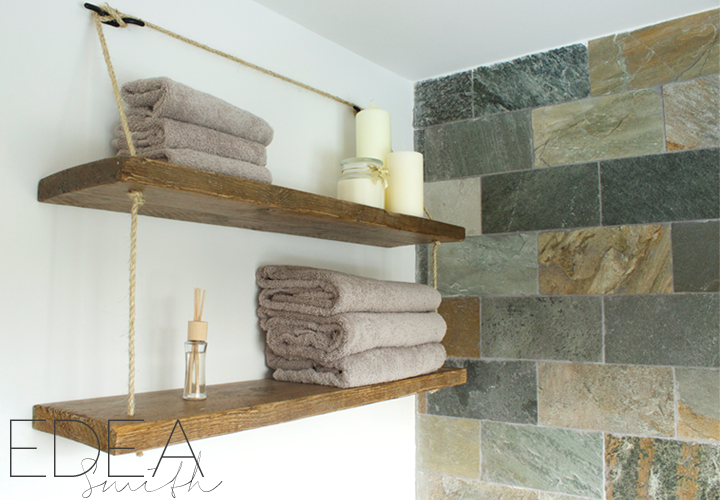 Floating shelves were a little too plain and i don't particularly like brackets. 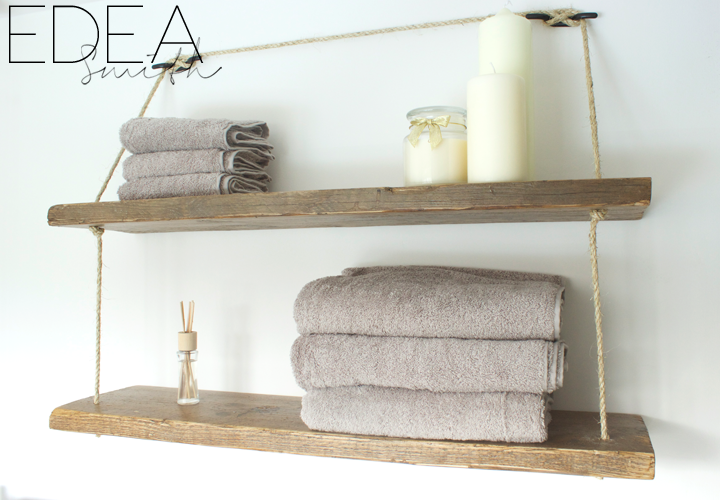 We looked into using 'industrial pipe' but by the power or Pinterest (hurrah) we came across shelves with rope. The design we came up with in the end was something we put together from several options on Pinterest. 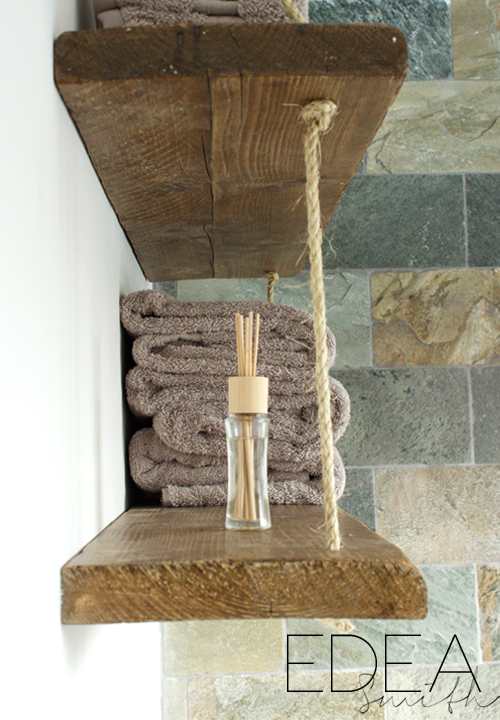 I loved the idea of a tan rope and not having bulky brackets. Our varnish was a mixture of dark and medium oak which was painted on and wiped off as required. Fixing the shelves - It was important that we invested in some 'heavy duty' adhesive to fix these shelves to the wall so we took a trip to our local hardware store where they recommended us a special adhesive for heavy duty items. After hanging the top shelf we left it for 24hrs before hanging the second shelf below, we then left this another 24hrs before putting any items on the shelf, the tension of the rope at the front along with the adhesive holds the shelves securely. Cost - The cost of these beautiful shelves was minimal. The boards we already had, i purchased the rope for around £3 and the only other item purchased was the extra strength adhesive (which cost around £6) so a grand total of £9 - win win! > Attach x2 wall brackets securely, approx 4" inside of each end of your wooden boards ensuring they are level. > Our rope length was around 4 meters in total. See Diagram Below - Working with the middle of the rope from the centre of the brackets  tie the left then right  allowing the rope to hang down from each bracket. Feed each side of the rope through the holes on the top board  tie a knot under each side (ensure your knot does not go through the board!) you may need a second person to help here. Whilst holding the board add your adhesive to the back length and secure this to the wall, you will also need your spirit level here. As mentioned above, we left this for 24hrs to dry securely. > When your 24hrs is up feed the rope through your bottom shelf and repeat the process above. I absolutely love it!!! 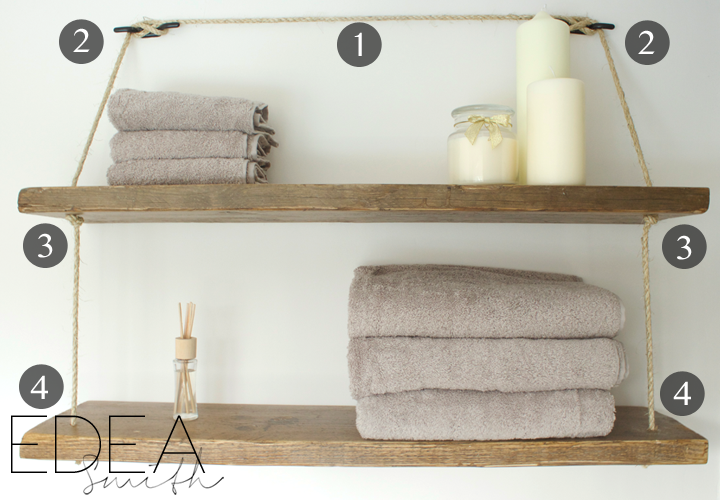 We have a beach feel through our home & this would be the perfect shelving idea to go with. Thanks for the inspiration. I'm so glad you stopped by as i actually found your blog a few weeks ago. I love how you write, images are awesome too. Lots of blog love! 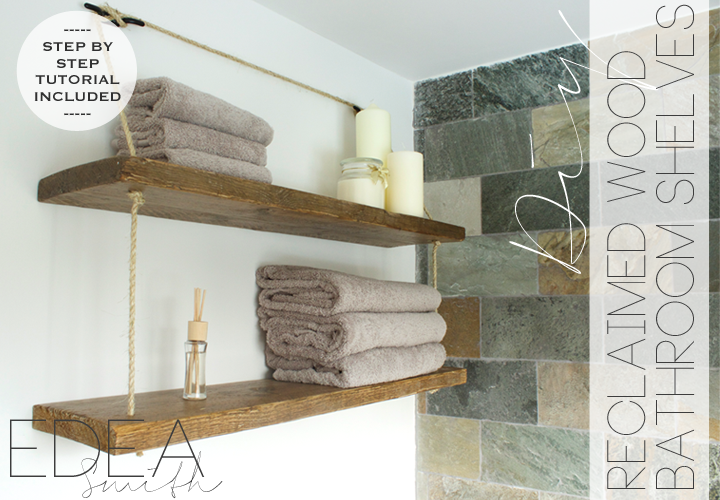 Love your shelves and what a great tutorial too. Thanks for linking to Inspire Me. Be sure to check back next week, you will be one of my features. Love them! 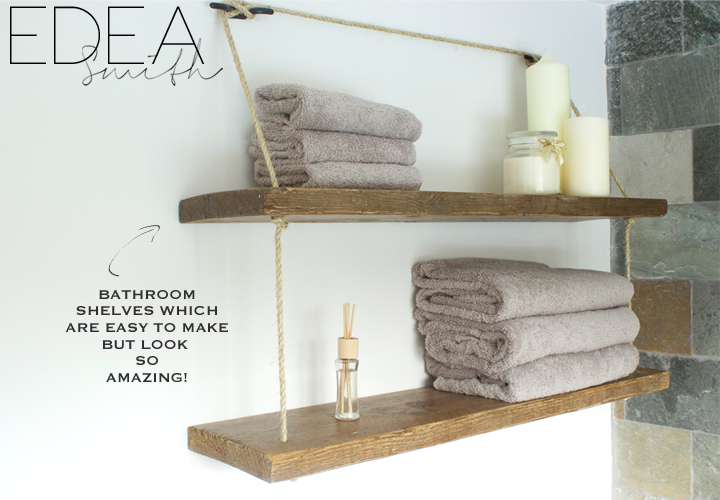 They look perfect in your bathroom. Looks great! I Love the 'hooks' that you used at the top. Thanks so much for linking up at the Make it Monday Party! Hope to see you again next week. 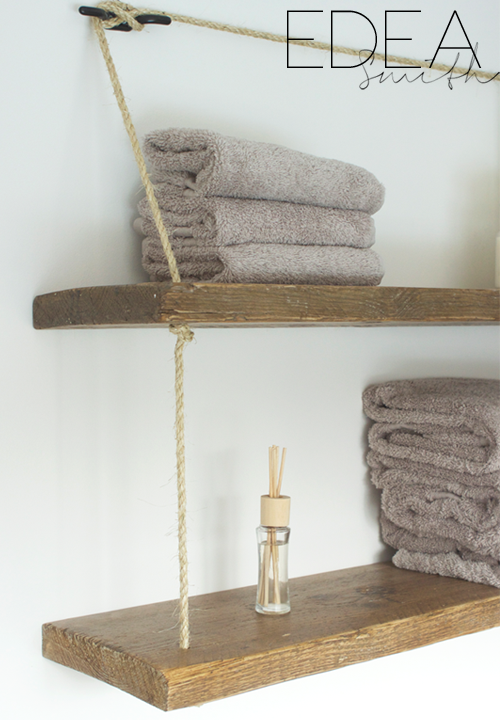 The hooks are SO good, we've used them on a few 'heavier' wall items in our recently. They work ace with the rope. I love this! So charming and rustic. You always do such amazing things! Thank you for sharing! These shelves are great! You do beautiful work! Please come and share! I would love it if you would join in on my Making Broken Beautiful party! It starts 6:00pm (MST) this Thursday September 10 and I would love to have you join up each week! Love the nautical look these give!